I first started Hallmarking the winter of 2009. It was just before New Years. Domingo and I were vacationing in D.C., and killing time before meeting family for dinner when we wondered into a hallmark store. It wasn’t even an ornament from the current year’s collection I first picked up, but the previous year’s “Welcome Friends” the store still had on hand for a steep discount. Hallmarking combined many of my great loves: shopping, bargain hunting and Christmas. Since I was new to the hobby there were lots of great ornaments that fit my ascetic found cheaply on eBay and Amazon. A few years after I picked up that first “Welcome Friends” ornament, however, I began to exhaust that supply. It wasn’t long before the only deals to be were after Christmas sales. That worked fine, up until I started have multiple kids, and couldn’t always make time for in person shopping. Last year, at 39 weeks pregnant I opted to just order online from Hallmark.com after the holidays. The ornaments were on sale, but I had to pay shipping. I paid effectively the same price as if I had bought in store at full price before the holiday, and didn’t even get to enjoy the ornament that year. Anticipating not making the after Christmas sale again this year, I purchased online from Hallmark.com, paying both full price and shipping. The truth is, now that I don’t have time for the bargain hunting aspect, the hobby isn’t nearly as enjoyable. It’s feeling more like an obligation and less like a joy. So for now, I’m likely stopping our hallmark tradition. Another tradition that’s changing this year is Black Friday in person shopping. The biggest driver for this change is time, and lack there of. We always intended our Thanksgiving tradition to be putting up the Christmas decorations after the kids go to sleep. There’s something magical about waking up to a fully trimmed tree and festive house. We haven’t met that goal since 2013, and with multiple trees it’s even harder. Nicole is already starting to question the existence of certain mythical entities, so this may be the last year to really embrace that Christmas magic while she still believes. We’ve been having better luck snagging deals online shopping anyway, and last year’s experience was pretty miserable (though I won’t be pregnant again during any future black Fridays!) So this year we’re committing to online Black Friday shopping only. As far as traditions go, ones based on shopping are the least worth preserving anyway. 2018 will forever be remembered as the summer of the jigsaw puzzle in our house. Jigsaw puzzles were a big part of my childhood. I remember sitting in front of the coffee table with my mom and sister, working on 5,000 piece puzzles together. The one in particular that sticks out in my memory was sheet music of Beethoven’s 5th. Growing up we had a collection a 100 and 250 piece puzzles that, when they became two easy, my sister and I would dump them over backwards and assemble them upside down. I even spent a summer with my best friend on an “impossible” branded puzzle which had no straight edges. Since that wasn’t challenging enough, the backside of the puzzle was stamped with the same image as the front side, just rotated so you could never tell by looking at a single piece if it was upside down or not. We were always destined to be a puzzle house. As new parents Domingo and I stocked up on baby puzzles. I remember baby Alexis chewing on the wooden knob of a Melisa and Doug Shapes puzzle, holding it in her mouth like a binky. I probably even have a picture of it somewhere. When the kids got a little bigger we tried the foam puzzles, and the kind that are meant to be stored assembled where the backing has an outline of each puzzle piece. The girls never really seemed that interested, and the puzzles stayed mostly in the closet, forgotten. We decided to change that this summer. 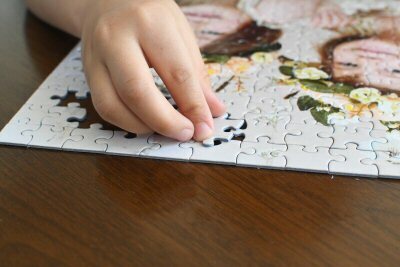 I wanted to try and bestow my love of jigsaw puzzles onto them, to see if I couldn’t pique their interest. This summer I purchased a 250 piece puzzle, just to see what the kids were capable of. Nicole, Alexis and I sat down to work on it together. The design ended up being a little more monochromatic (see above), and thus more challenging than I anticipated, but that didn’t stop the girls from getting into it. Even Alexis was able to put some pieces together, and she’s three and a half! From there we broke out the 48 piece puzzles and when those were two easy, I mixed up the pieces and had Nicole do two puzzles simultaneously. When that proved too easy Domingo found some 100 piece puzzles. In no time the girls were assembling multiple puzzles a night together, though Alexis can do the 48 piece puzzles herself. Alexis told me quite emphatically recently that they did not need my help. I can’t wait for Dana to get a little bit bigger. We’re going to get a coffee table, and then really see what the kids can do! As much as I still want to think of you as a newborn, I now have two pointy white reminders that you are most definitely not. That’s right, someone is cutting her first teeth! A full two months earlier than either of your sisters. You are determined to march to your own drum, and keep this “experienced” mom on her toes, that’s for sure! 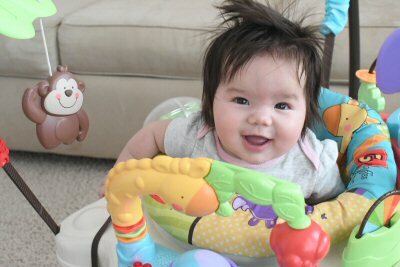 We started solids last week, which was super exciting for your sisters who were eager to show you how it’s done. We choose your purees to match the vegetables they were having for dinner so they could show you how to eat the non-mashed kind. It was the best I’ve seen Alexis eat her peas in a long time, so I thank you for that. So far your favorite seems to be squash, but you did equally well with carrots and peas too. This month we finally were able to break you of the swaddle habit. You seemed unable to settle down and go to sleep without the swaddle, but also uncomfortable when we swaddled you. It was an ongoing battle until I figured out why you like the swaddle so much. I believe the soft muslin fabric reminds you of mommy’s shirt. Every time we nurse, you like to pull Mommy’s shirt over your face. I think the swaddle blanket rubbing against your check reminds you of mommy and that’s why you find comfort in it, even though the act of swaddling is no longer comfortable to you. Once we figured that out I started loosely wrapping you in the blanket and you slept so much better. Of course this means you only get a blanket at nap time when we can keep an eye on you. Once it’s safe for you to sleep with a blanket at night, the muslin swaddle blanket will probably be promoted to blankie. You love to stick your tongue out to let me know you want to nurse or nap. Thumb suckings, and finger sucking for that matter, is now passé. I can’t remember the last time I saw your hand in your mouth. Instead you’re all about gnawing on anything that crosses your path, including mommy sometimes! Those teeth will likely fully erupt in short order. I can’t believe how quickly time is flying, or that we’re already halfway through your first year. It doesn’t matter how big you get, I will always think of you as my itsy bitsy baby. Six. How is it possible? I feel like it was just a few weeks ago that we were signing Nicole up for kindergarten, a month or so ago that we were bringing her home from the hospital. And now she’s six. Six. Nicole requested her kid birthday party be at Chuck-E-Cheese again this year. Two years ago the experience was super smooth, but I was dreading it this year. As a special treat the birthday ‘star’ gets to go in the ticket blaster machine. For one minute the birthday ‘star’ collects as many tickets as possible, as wind blows them about. At least for the small kids, they get to choose a friend to accompany them. Two years ago, Nicole’s friend got intimidated at the last minute and Daddy accompanied her in the machine. Alexis was too small to attend the party then. This year Alexis was joining us, along with many friends from summer camp. There was no shortage of kids to choose from. I was sure Nicole would pick a friend over her sister, and that Alexis would be heartbroken to be left out. In the end my fears were unfounded. Nicole chose Alexis. Not only that, but she happily pooled all her tickets from the day with Alexis so they could each get a toy. Nicole got a gumball machine, Alexis a magic mirror. This kid has a heart of gold. We had are traditional swim in the pool with Grandma and Grandpa, and the great helium balloon release in the stair way. Both kids actually eat their cake this year, rather than pick at it, much to my surprise. 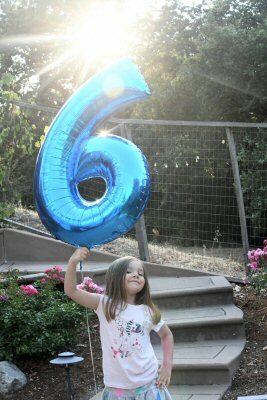 Of course we had our traditional giant foil number balloon photo time. The only thing we weren’t able to do was a restaurant dinner like she wanted. I promised to make it up to both girls later by doing one on one lunch dates with them before the start of school. Two years ago I officially rebranded as Datayze, and forever changed the trajectory of my business. Four days ago I did a major new launch, and this change could prove to be just as meaningful. Not only is the set up more professional – I can now monitor site health from my phone! but I can also do light weight debugging from the rocking chair. Productivity is up, and so is what I’m dubbing ‘developer confidence’. This past year I’ve had six times the users, six times the revenue, and six times the page views. My Alexa rank is 127,191 surpassing the ranks of all my major competitors, and grown from 4,000 monthly users to a quarter million. It’s stunning to me that I’ve been able to maintain a near 20% month-over-month growth rate since Datayze’s launch. I remember when 600 daily users was a big deal, and crossing the threshold of 1,000 daily visitors. Then came the mornings where I’d reach for my phone as I was getting out of bed to see if Datayze had already had 1,000 visitors by 6:30am. Followed by mornings where I’d eagerly check to see if it was 3,000. Then there are the intangibles not reflected in the numbers. Datayze is having a real impact. Growth will inevitably slow. It already is showing some signs of a slow down (though I’m still hoping that’s summer related.) I’m hoping to spend the following year diversifying more and insulating myself from seasonal patterns. Diversifying could mean a wider portfolio of apps, or multiple different revenue sources. I also wouldn’t say no to an Alexa rank of 100,000. Forgive me for a late update, I’ve been working crazy hours ahead of this last launch. I was desperate to get it out during the holiday week when traffic was low. So far everything looks great, but before I get into that let’s talk numbers. In June I earned $630.34, just under $100 from March’s high. Users are down 6% overall, and down 9% from organic traffic, two numbers I’m not thrilled about. Mobile users is up 5%, while desktop is down 25% and my Alexa rank continues to inch upwards, a possible sign that summer may be keeping people away from there desktops. I’ll be keeping close tabs on the numbers this month. Delaying the launch was outstanding issues in Time Until and Miscarriage Chart. Combined those two apps make up 66% of my traffic so they needed to work flawlessly ahead of the launch. The primary hold up with the Miscarriage Chart had to do with my new approach to mobile. Prior to the launch I had been using PHP code to detect device type (mobile or desktop) and serve appropriate content for the screen size. The primary advantage of this approach was I could serve vastly different html per device. The drawback, however, the PHP code needed to be kept update with the ever changing device landscape. Now that tablets are becoming more common, there’s more device types and screen sizes I need to pay attention to. It was going to become unmanageable. I’m now doing the cleaner approach of using media CSS statements, but it took sometime to find a block of HTML code that could be display as desired correctly across all device sizes via CSS. For Time Until I wanted to incorporate time selection into the datechooser modal to clean up the interface a bit. I had started this process last year and finally felt comfortable that it was bug free and wouldn’t hurt my brand. I wasn’t sure it was as intuitive as the original datepicker. This is we’re having more experience with interface design would be useful. The interface could still use a little more work – here’s where not having a UX experience is working against me – but it’s better! The past month, and especially this past week has been crazy busy ahead of the new launch. During evening and middle of the night time feedings I’d test out my site on my phone. I’d open every app on my phone, test every possible input, including invalid ones. I’d check the site health on my new admin panel and logging bugs and issues into todoist, all from my phone. During the day I’d hammer out as many quick fixes as possible. Truth be told I’d rather have another week before the launch, as not all apps were working quite to the level I wanted, but most of the issues I was discovering existed in both my test bed, and the previous launched code already in production. I didn’t want perfect to be the enemy of good. I was initially thinking I’d have a long night ahead of me, but I’ve been watching the admin panel and have confidence there are no major fires.